By the 1980s, the number of old titles being re-published in paperback obscured the fact that the number of new titles published had plummeted: only half as many were printed in the 1980s as in the 1960s. This was the decade that saw the publication of Michael Morpurgo's War Horse (1982), though it made little impact at the time. 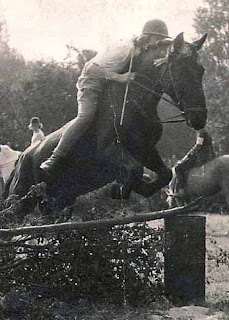 The new authors who appeared in the 1980s tended to produce the standard pony adventure that had been so popular over the preceding decades. 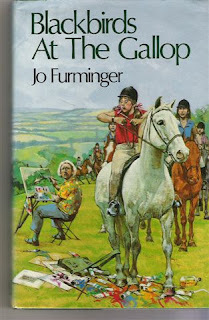 Jo Furminger carried on her Blackbirds series, the adventures of a group of children and their ponies, and her daughter Justine Furminger contributed two books of her own: Bobbie Takes the Reins (1981) and Bobbie's Sponsored Ride (1982). Wendy Douthwaite wrote about girls and their ponies. Apologies for yet more silence.... this was caused by my very wise decision to put the camera battery recharger somewhere safe. And then not being able to remember where the somewhere safe was. As I have an awful lot of old book stock I want to shift, I've been husbanding the battery power for photographing books, though did do a quick sortie because I wanted to photograph the crows. 2. I inhabit an odd parallel universe where the shoe cleaning box counts as a sensible storage option for a battery charger. Unfortunately I do not inhabit that universe all the time. The number of new pony books published in the 1970s was half that of the 1960s. Plenty of titles were still appearing, but many of them were reprints. The Jill books appeared in a new guise with covers by W D Underwood. Pullein-Thompson titles appeared on a regular basis, towards the end of the decade with a new feature: the photographic cover. Changing the cover was a quick and easy way to make a book appear up to date, even if it had originally seen the light of day in the 1940s. The quality of the covers was variable: some took little notice of the actual content, and there were plenty that although intended to reflect the story, were awkwardly posed. The planning committee met to decide Barwoods' planning application for the field, and it was rejected. The expectation is that Barwoods will appeal. So, for the moment at least, our walk is safe. I'm delighted to welcome Maggie Dana to the interview spot. Maggie is the author of the excellent Timber Ridge Riders series, which she's re-issuing, and re-writing. She has some fascinating things to say about the process of updating books, and the differences in readers now and when she originally wrote the books. Book three, Riding for the Stars, is now out, and Maggie's working on book four. Can you tell me something about where you were born and brought up? Another series of catch up posts. 9th August Before I went away, harvest hadn't happened. 10th August Whoever lighted this fire at the edge of the field was lucky the ground was still sodden. We weren't so lucky a couple of years ago when someone started a fire in our field and we lost the whole of the top two acres. It's supposed to be re-generating as a flower-rich meadow, and the fire put it back several years. And the church clock is now finished! Bales that you could lug along by yourself are a thing of the past. Dog obligingly trotted by this one so I could get the scale. There's still a few lone, unharvested, plants at the edge of the field. I love these great, leaning, towers. Temporary architecture. Whistle recall - good dog!